When it comes to birthdays, it seems like different people see them in a very different light. You have those people who really don’t care all that much, it’s just another day. Then, there are the people who embrace the fact that they’re still on this beautiful planet for another year, and happily celebrate. And then you have the last group, which dreads getting older and sees birthdays only as a reminder that they’re not getting any younger. Well, my best friend falls into this last category. So, when I asked her what flavor cake she wanted for her birthday, she said, “Meh, I don’t want a birthday cake.” Fortunately, I’m stubborn and don’t listen very well, because I decided right then that I would still make her a cake, and surprise her with it at work on her big day. But, I wanted to do something different. Something that I knew she would love. In high school and college, she was a big science buff. She had two science majors in college along with a minor, and it’s always been something that she loves. So, for my science-loving birthday-hating BFF who appreciates my goofy sense of humor, I decided to go with something that would be somewhat humorous, but also pointed out the positive aspect of having another birthday. 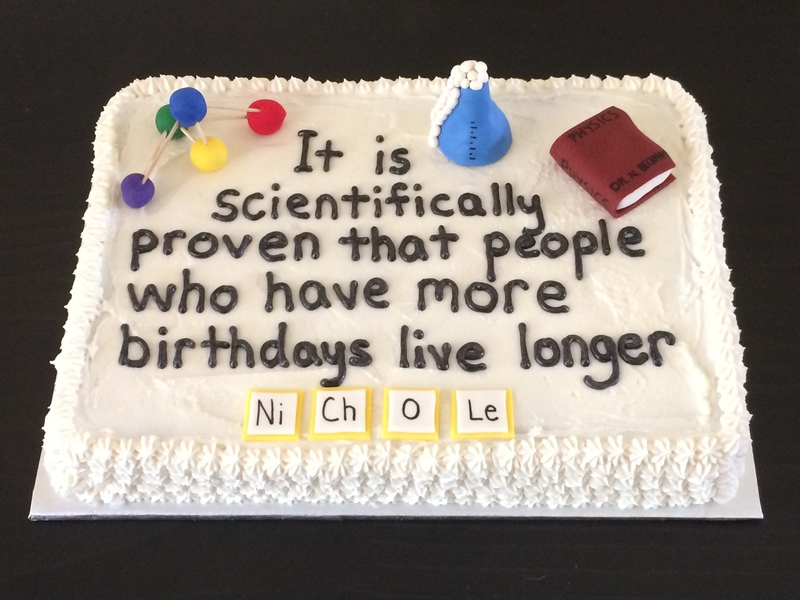 When I started searching for science cakes and funny birthday slogans, I came across one that was absolutely perfect. Scientific, to the point, and funny. That’s when the thought of making it a science themed cake would go together so perfectly with the slogan, and the fact that she’s a science fan. All of the decorations are made out of gumpaste and fondant. This really didn’t take as long as I had expected, and actually had the 9×13 inch cake pan sitting in front of me to make sure these little decorations would be a correct size. Since there would be a lot of writing on the cake, the decorations would need to be small enough to fit, but large enough to create the right amount of space between the decorations and writing. Oh, and have I mentioned that she loves Oreos? So, I decided to go with a simple white cake, but that was packed with chunks of Oreos all throughout. Preheat oven to 350 degrees. Combine first six ingredients in mixing bowl, beat at medium speed for 2-3 minutes. Dip each Oreo cookie in milk, break into 4-5 pieces, place in batter. Gently stir cookies into batter, incorporating well. Grease and flour a 9×13 inch cake pan, spoon batter into pan. Bake for approximately 35 minutes, or until top of cake is golden brown and is slightly pulling away from sides of pan. Cool in pan on cooling rack for 10-15 minutes, remove cake from pan, continue cooling on rack until completely cooled. Ice and decorate as desired.